Old Perpetual is the most striking feature at Hunter's Hot Springs. Old Perpetual Geyser erupts up to 60 feet into the air about every 90 seconds. The site of this geothermal wonder erupting like a rocket into the sky is magnificent. 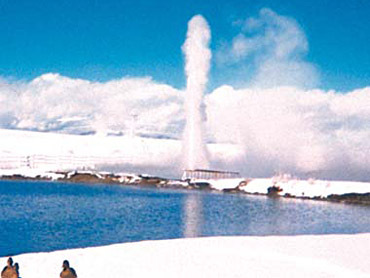 It is the only active geyser in the west, and one of the more popular tourist attractions in Lakeview. 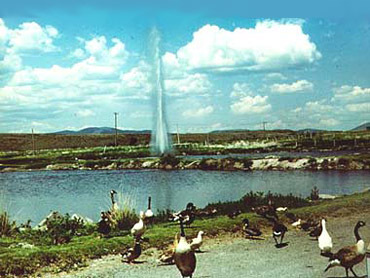 Hunters Hot Springs & Old Perpetual Geyser is one and a half miles north of Lakeview. June 2009, the geyser had stopped erupting for several years, possibly due in part to the nearby geothermal development by the town to supply hot water to the Warner Creek Correctional Facility. Further development of the site for geothermal power generation has threaten the entire hot springs & wetlands. But as of May 2015, Old Perpetual started regularly erupting again. The springs are known to the locals as Hunter's Hot Springs, but in 2000, the owner renamed the resort to Geyser Hot Springs. The USGS only recognizes the variant name Geyser Hunters Hot Springs. In 1832, The hot springs were discovered by trappers from the Hudson's Bay Company, who noted in their journals that the water was very hot. Hunter's Hot Springs are named after Harry Hunter, a land developer from Minnesota who was visiting the area In 1919 In 1923 he purchased the 40 acres which included the hot springs and started developing a health resort called Hunter's Chlorine Hot Springs Club, as a therapy, rest, and recuperation resort. He later drilled three wells on the property and all three erupted as hot water geysers. Two geysers eventually died away, But Old Perpetual is still erupting. In 1925, the original resort building was constructed and then a second building in 1926. Then in 1929, 5 doctors purchased the hot springs, club facilities and equipment and opened a restaurant. Sold in 1943, new owners built a motel and cocktail lounge to add to the resort facilities.